The Showy Decrease is back again. It’s been mentioned in 14 posts so far, but that doesn’t mean we’re done with it by any means. Not even close! While this post summarized all the fun ways we’ve used the Showy Decrease to date, there’s still a lot more we can (and will) do with it. We’ve just added a boatload of new readers. Thanks and welcome! If you’re new, you can pop over to our Getting Started page to catch up on just what this Showy Decrease thing is all about. One of the best parts of blogging is ‘meeting’ knitters from all over. Donna wrote to me wanting to know how to use the decorative lines of the Showy Decrease in her tam. I had the perfect fit – the Showy Central Double Decrease. It’s the easiest modification of all the Showy Decreases so you’re going to love it. I thought it would be fun to experiment with a ruffle concept to compare the options … so here we go. First of all, there’s really nothing wrong with the standard Central Double Decrease (CDD). It’s got nice lines and doesn’t wobble back and forth. It’s knit like this: slip 2 knitwise, k1, pass 2 slip stitches over. 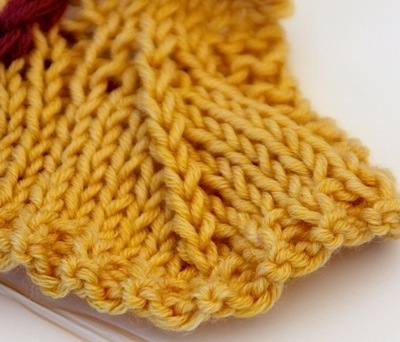 The Showy Decrease links lines of decreases with a slip stitch. It doesn’t just elongate the stitch, it raises the decrease up off the stockinette fabric, turning it into a decorative element. 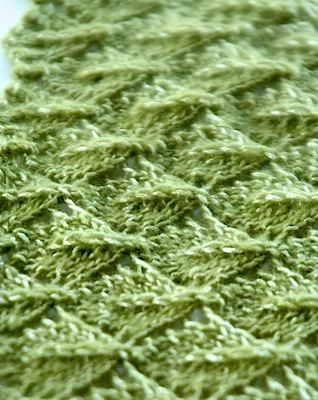 The Showy version of this decrease adds texture and height to your knitting. The center stitch lines up perfectly with the slip stitches. We modified the leaf pattern in the Tranquility Shawl (above) to add nice clean lines and depth to this popular stitch pattern. The photograph taken from this angle shows you the lovely Resilient Cast On. Its flexibility makes it a great cast on for curved edges. Ready to add some real punch? Add a contrasting color to your Showy Double Decrease. The technique creates a beautiful solid line of color. Your color selection determines whether it’s a pretty highlight (tone on tone) or the dramatic contrast as shown here. The chart below shows you how to add contrasting color. 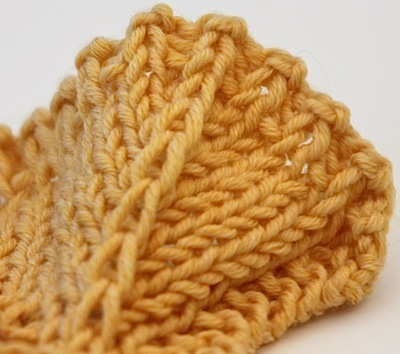 Start with a cc knit stitch one row before the first slip stitch. Note how just the stitch to the right of the decrease is worked in CC. Make sure the MC carried behind the decrease is not too loose or there will be a gap. I’ve yet to meet a knitter who carries strands too loosely so this shouldn’t be an issue. Here’s a chart with the various alternatives. See how the stitch that results from the decrease is perfectly positioned to be slipped on the next row? Sweet. 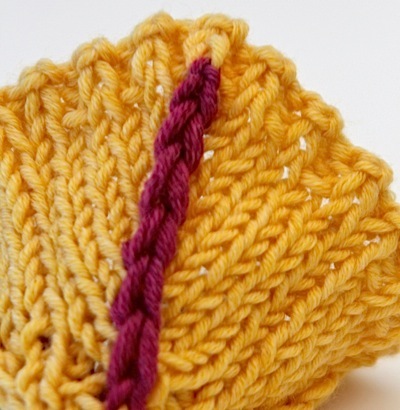 Update: Check out our October 29th post on knitting raised Contrasting Showy Decrease lines. Here are some resource links if you’d like to explore this idea a bit further. The Techniques page on our web site has free downloads for all our “Nuances”. 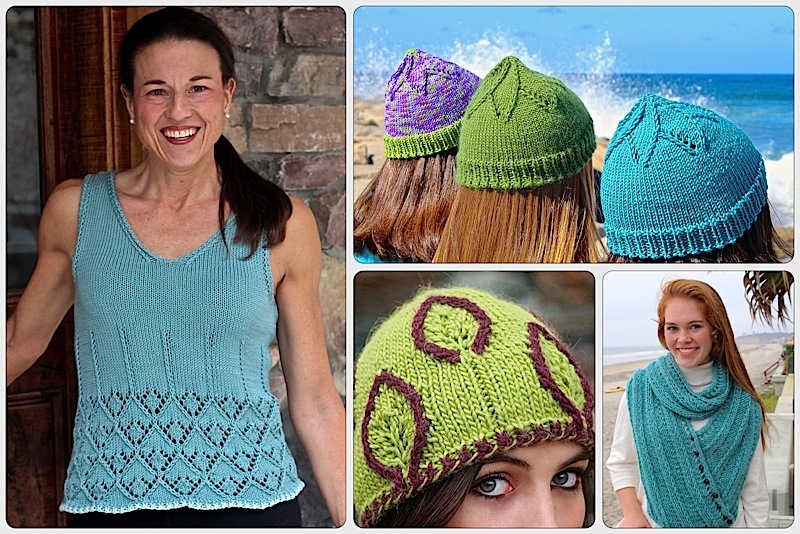 Our free Ravelry eBook includes 3 patterns to get you started. The Tranquility Shawl and Rip Cord Hat use the Showy Double Decrease. Check out the Fiftyfifty Shell published in Knitty to see how the Showy Decrease adds texture to stockinette. How do you rip back the cdd!?! Laurie, You will want to rip back to a wring side row/round so that your next round when you start knitting forward again is a right side. You should be able to see the 3 sts separated with the long slip st in the middle. Unless you are using something really slippery they should hold their places even with the needles out. Sorry you are ripping back! This entry was posted on August 19, 2014 by Laura Cunitz in Nuances, Showy Decrease and tagged Resilient Cast On, Showy Decrease.